Our Announcement Management System (AMS) is able to easily control messages everywhere they are needed including baggage claims, moving walkways, escalators, and public areas. From your computer you can change and schedule all of your automated announcements. AMS is the most powerful tool of its kind and can be used to cost effectively keep your announcements current and relevant. These messages can be directional and help your visitors get to the right places. They might be safety messages that prevent injuries by informing passengers of behaviors that might cause them harm. The messages also might be advertising for local shops and establishments. If you prefer, Sound View Electronics can manage some, or all, of your announcements. 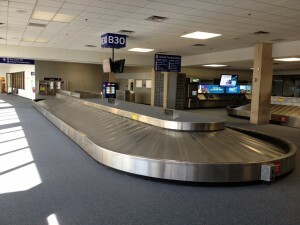 Many airports use an annoying buzzer that plays when the conveyor starts delivering bags on the baggage claim carousel. Why not send a pleasing alert followed by instructions to your arriving passengers about the safest way to retrieve their baggage. These could also announce that all bags are finished being delivered and where to go for baggage assistance. Some airports have chosen to play advertising messages while the carousel is stopped. These could be played infrequently so they are not overly intrusive. Like all of our messages, they can be scheduled to play only during hours when the airport is open and has passengers. 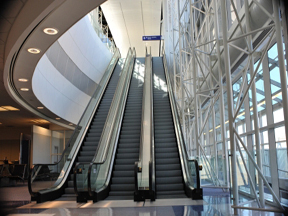 Sound View’s messaging system is ideal to enhance an airport’s moving walkway and escalator safety systems. Imagine a family is disembarking from a long red-eye flight. The exhausted daughter sits on the escalator with her beautiful long hair precariously close to the stairs. Shortly after getting on the escalator, the mother hears the announcement “Please do not sit on the escalator.” She reaches down and takes her daughter’s hand, pulling her up to stand. A potential disaster is avoided. The passengers get home safely and the airport avoids possible litigation and insurance increases…. all because of an automated messaging system. Our systems are a great way to give instructions and directions to riders that will help keep the traffic flowing. An instructional message may be a reminder to riders that they should have their picture identification out and ready to show the agent. In some airports, passengers may have to take a few moving walkways to a large lobby and then an escalator to the baggage area. Our directional messages might play on the last walkway advising passengers to” go to the left of the lobby to the escalators that go to the baggage area”. This can certainly help keep the flow of people moving. You can also do advertising with our announcement system. Imagine that a traveler has just arrived at an airport; he’s hungry and he has a 90 minute layover. He gets on a walkway and a message plays offering a free beverage with any meal at Roberto’s Bistro. A simple message like this can increase patronage. If you are looking for a way to generate income from the Airport Advertising please contact us to discuss how this can be done on your moving walkways or escalators. Our systems include everything needed to message repeaters, amplifiers, and the widest variety of speakers. Our speakers come in nine different configurations to insure that we can deliver quality sound that attractively fits with your system no matter if it is glass, brass or stainless steel. Our amplification systems are durable and they deliver the power to drive as many speakers as your situation warrants. Our system has the ability to play one or two message groups. They can be delivered automatically or can be started by the motion of a passenger passing a sensor. We can deliver messages in any language and we can change the messages for you or you can change them from your own computer. If you have systems in place, they can be improved by adding a few components and gaining the benefits of local control.